A large solid chunk that forms in coldblood. After death, a substance in the blood hardens, and that which does not crystalize is called a blood stone. This is no mere chunk, it is nearly a boulder. Few blood stones of such size have ever been discovered, even considering the combined experience of all the hunters. 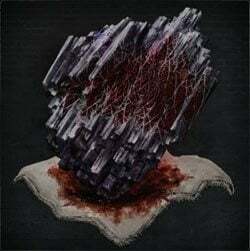 Blood Rock is an upgrade Item in Bloodborne. Used to Fortify weapons to +10. The main game contains one Blood Rock per NG cycle. It is found near Nightmare of Mensis: Middle Loft. There is also a chance of one dropping from the final boss of any depth 5 root chalice dungeon. With the addition of The Old Hunters, there is one more Blood Rock in the Fishing Hamlet. Down the elevator leading to the boss, go into the large room opposite to the tunnel guarded by 2 Winter Lanterns and at the other side (through many snail women) you'll find the Blood Rock. The way to the Blood Rock from Lighthouse Hut lamp is shown . After Patch 1.09 you can buy Blood Rocks from the Insight Shop in Hunter's Dream after beating Mergo's Wet Nurse. One Blood Rock costs 60 Insight. To get to this item easily and painlessly it is recommended that you return to the dream and spend all your insight. After that apply the Deep Sea rune for frenzy res, and wear your best frenzy res armor. Make sure you also have plenty of sedatives. Then spawn at the Mensis: Middle Loft lantern after killing Micolash, Host of the Nightmare, head outside, up 2 flights of stairs, and get into the bird cage elevator. During descent, there is a window you can jump into from the elevator (see video below). From this point, run across the bridge with the 3 Winter Lanterns using the skull-rocks to avoid Frenzy. Run past the spiders, descend the stairs (careful in this room there is a hole in the floor which you can fall through earlier than wanted,) pull the lever on the balcony, this will trigger a cut-scene showing the Brain of Mensis drop into the abyss. After the cut-scene, turn around and drop down into a hole on your right. After dropping down the hole, run outside, collect all the items, drop down into the collapsed tower on the bridge (avoiding the bottomless pit in the center of the room) and there is a body holding the item. Note: The Brain of Mensis is the creature causing Frenzy in the entire Nightmare of Mensis area, so the 'Killing the Brain of Mensis' option below is high-risk and should be avoided. Pulling the lever in this option allows players to get Blood Rock with no risk of Frenzy aside from the Winter Lanterns, and drops the Brain of Mensis into a abyssal pit where it can be killed without inducing frenzy. This also allows players to get the Tier 3 Moon rune. After killing Micolash, Host of the Nightmare, use the Iron Door Key to open the door located on the left side of the wall at the beginning of the boss fight. The door will open onto a bridge with numerous Insight items, and lead to a collapsed structure. Drop down into the collapsed structure to find the Brain of Mensis and a body holding the item. IMPORTANT: Killing the Brain of Mensis this way will prevent one from obtaining the Tier 3 Moon Rune from her via the 'Make Contact' gesture in the abyss. You will, however, still get the Living String required for the Great Pthumeru Ihyll Chalice. By making contact and getting the Moon rune then killing the brain, you can get both the rune and the Living String. This item is also available in high-level Chalice Dungeons such as Isz Root Chalice or Lower Loran Root Chalice. It is a low drop-rate, so make sure you have high Discovery, which can be increased either by adding points to the Arcane stat or using certain runes. The community has shared a few glyphs that contain blood rocks. Big thank you's to those who created and shared these chalices! Great One's Wisdom will replace Blood Rocks, (just like runes), if already obtained in that Chalice type. This limitation does not reset upon entering NG+(+). Rumored to reset upon some trigger, or through PvP victories, but none confirmed. Blood Rocks can also be obtained by defeating Depth 5 Chalice Dungeon bosses. Pthumeru Ihyll: Glyph: jrwffkyp. Just after Chamber of the Seal, before main area. In the first pre-area. Beware of fatty. Pthumeru Ihyll Root Chalice (Cursed Fetid Rotten): zziz2qbx. Layer 2 (pre-area before the boss room). Sinister Pthumeru Ihyll Root Chalice: Glyph: u6d8itwm. Sinister Pthumeru Ihyll Root Chalice: Glyph: hdmg5dzw. Defeat the layer 3 boss. (Pthumerian Descendant) Also had highest tier "Eye" rune equipped. Fetid Lower Loran Chalice: Glyph 7guktqyg, Layer 1 (In the side area before the boss room). Lower Loran Chalice: Glyph 6rxwxu3e, Layer 1 (1st bonus door, does not require offerings). Rotted Lower Loran Chalice: Glyph gysprnag, Layer 3 upon beating the Aborrant Beast Boss. Fetid Rotted Lower Loran Root Chalice: Glyph xf9deybn, Layer 1, side area before the boss room. Isz Root Chalice Glyph rr4jfbys, layer 3. Located through the bonus room past the boss gate. Isz Root Chalice: Glyph fsieuy9x, layer 3. Isz Root Chalice: Glyph wbgypzky, layer 1. The blood rock is in the very first forked path, before the second lantern. A very straightforward path, there's a regular zombie, some spiders and a brainsucker on the way to it. Isz Root Chalice: Glyph s626p982, layer 1. Fetid Rotted Cursed. In the bonus room past the boss gate. The chest room has a tomb prospector hunter, a brainsucker, and a horde of celestial children. Isz Root Chalice: Glyph gftbrfx6, layer 3; 2 blood rocks. 1st : chest in a bonus room before the boss. 2nd : for killing the boss; the Pthumerian Elder. Isz Root Chalice: Glyph xdsyzmp6, Layer 2. Isz Root Chalice: Glyph h6panx99, layer 3 . Fetid Rotted Cursed. Pre-Lamp side area. Blood Rocks found in Chalice Dungeons seem to have a reset trigger (has yet to be confirmed, possibly after a certain time has passed?). It has been claimed you can get a second from Chalice Dungeons if someone shares the Glyph of a dungeon containing it but this is yet to be confirmed. Maybe put an asterisk or something when giving IMPORTANT Info? Or put the IMPORTANT part UNDER the description which would prevent one obtaining whatever (in this case THE MOON RUNE!!!) Grr. I was Lucky I guess, my Arcane is lower 15. I better start leveling up. Glyph 5pwujscd – earned a total of TWO Blood Rocks from both bosses Ebrietas (Level 3) and Amygdala (Level 4)! So I just got 2 bloodrocks for ailing loran chalice type I read here it’s only suppose to be one? Maybe I’m just lucky as rest of the glyphs are now giving mad ones wisdom. There was also something in layer 2, but i forgot if it was a rune or a weapon. What do you mean by start by "spending all your insight"? High insight just makes the game more difficult with frenzy, right? kinda hilarious i got it from depth 5 celestial emissary, was hoping for the challenging ebrietas but nope, big blue blunder drops his rock. In the bonus area before 1st boss, not much resistance along the way. Just stay on the top floor. Rock in Isz Root: Before the dungeon actually begins, first side hallway before actually entering the dungeon. Only enemies are 5 blobheads, a witch of hemwick, and a brainsucker. I&apos;ve killed the wet nurse but no blood rock in shop? why is that? Someone told me there was 5 BloodRocks in each play through. And just got another three from the glyphs in this webpage. I&apos;m absolutely sure that I got 6 blood rocks this time. Seems like you can farm Blood Rocks from Ebrietas in Level 3 Isz Root Chalice. Can&apos;t tell the drop rate, though. I got one from Ebrietas in a non-root Isz Chalice (the one she drops after beating her in the main game the first time). I&apos;ve also seen videos of people getting Rocks from Loran Darkbeast in Lower Loran, Layer 3. Pthumeru Ihyll Root ChaliceGlyph: 9vb3tzzaLayer 3 (pre-area before the boss room). Pthumeru Ihyll Root ChaliceGlyph: 9vb3tzzaLayer 2 (pre-area before the boss room).